In all seriousness, The Northern Arizona University located in Flagstaff now has posters outside of on-campus restrooms that ask students to consider whether they have “pee privilege.” As one of the unenlightened, this writer never gave that much thought. Peeing is something simply done at various times during the day–every 5 minutes for those on diuretics. But intellectual analysis of this function was never considered….until now, thanks to university wisdom. 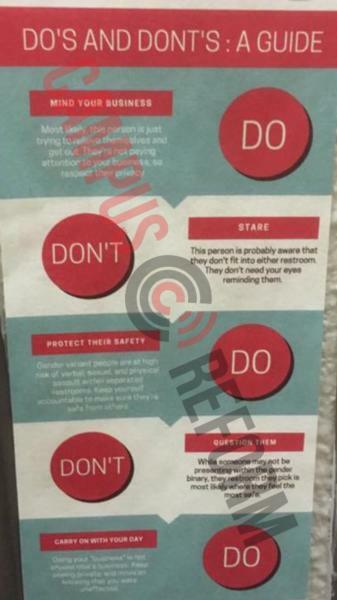 Other posters are up with a DO’S AND DONT’S GUIDE, offering this counsel: “Feel like someone is in the “wrong” bathroom?” Notice the word ‘wrong’ in scare quotes. It dribbles on to command all users of the facility,“Don’t Stare!” This person is aware that they don’t fit into either restroom so they don’t need anymore eyes reminding them.” So there! 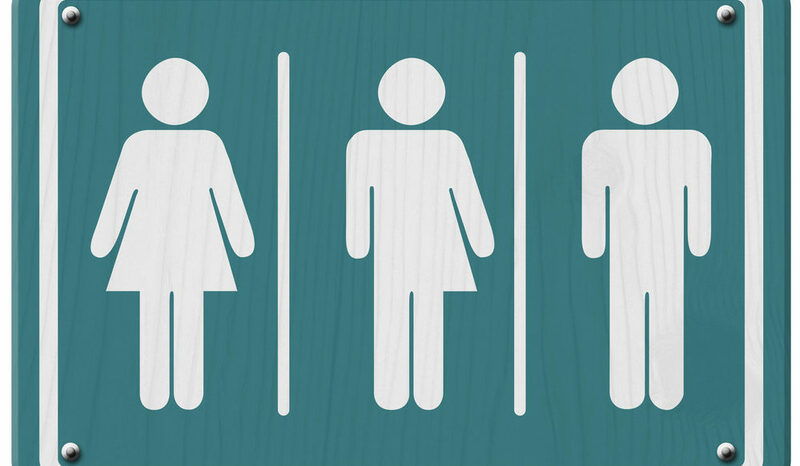 Bathroom users are subtly ordered to protect the safety of any transgender there since, “gender variant people are at a high risk of verbal sexual and physical assault.” Other users must make certain that they are safe from others. Yep, recruited to be watchmen on the stall. Other tips (at least for males) explains that having the ability to use a restroom without fear or concern for your own safety constitutes such a privilege–except possibly in San Francisco. To possess the latest social malady, men must be conscious that (to) stand and pee in a urinal is anti-woman since women do not have equality to do so. Inequality means that men can aim, women cannot. So this must be changed. Here’s where the rubbers hit the road. MilesTones offers that a possible solution would be for men to squat in the urinals so the women or would-be women would not be offended. Indeed, the ‘feminists’ now are pushing that urinals be removed altogether. THEN true equality would be in place. The only reasonable solution. Years ago I watched my pup discover a frog in the backyard, edged up close to sniff the frog which then jumped away as only frogs can do. The pup rared back and cocked his head in amazement, seemingly wondering why he could not jump that way. But the pup didn’t start a movement demanding equality with the frog. Each life has its own distinctiveness. Even the pup seemed to realize this. The highlight of this story sent by Dr. Doell was the huge number of responses that followed the piece. Every wit in the world piled on….at least half of them did, and this writer laughed so loud reading them that my wife could hear me at the opposite end of the house even though I was in a closed office. One used a term that I hate that has the equivalent to being ‘ticked’ off. It was such a perfect response that it provoked a hearty laugh despite the words used. My favorite one was by a writer named, Bob Duckworth who stated; “Damn the Sign, Full Stream Ahead!